What is a deck tie down? 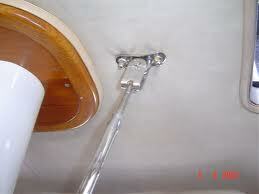 A deck tie down keeps the deck from being pulled up on keel stepped masts, where the mast does not sit on the deck. When the halyards are led aft via turning blocks attached to either the mast collar or the deck surrounding it, the deck will try and pull up as the line becomes loaded. The deck can also be pushed up by the compression of the hull, typically, caused by rigging tension. 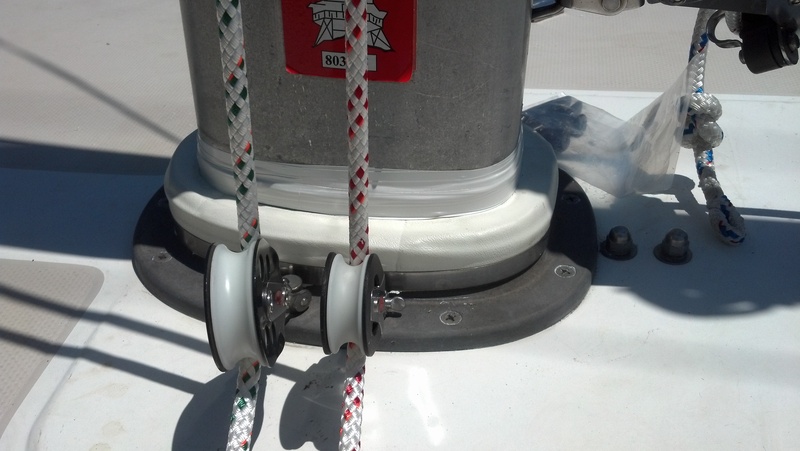 Deck tie downs come in various configurations. They can be found as a long pin that goes through the mast and mast collar at the deck partners. This is usually the method used by Island Packet (although this is not a preferred method because there is no way to tension the “Tie-down” and is merely dependent on how perfect the hole is drilled AND hopefully the hull hasn’t moved). Another widely used variation is a solid stainless steel or bronze rod, also called a panting rod, which goes from the deck where it is capped off with an adjusting nut, down to the step. Metal eyes (pictured above) or tangs can also be fastened to the underside of the deck or deck ring. This type of Tie-down can then be attached to the mast below decks, via another tang at the mast and then tensioned with a turnbuckle. There are also a few other configurations. In general, when the mast is not sitting on the deck to keep it tied down, it is a good idea to come up with some sort of deck tie down system. This not only ensures stiffness, which is very important in a sailboat (yes, even for cruising designs) but more importantly, could also keep your boat’s deck from being badly damaged. If you are in doubt as to whether or not your boat is equipped with a deck tie down system or should be, contact your local rigger to have a look.